Wow! We finished our project and boy are we tired!! I am home sitting in my chair resting after traveling for almost 24 hours from Chile. Yes, the one in South America! We were there 2 weeks enjoying the hospitality of a wonderful and loving people! The Chileans are descendants of native peoples as well as spanish and german people who moved into the area throughout history. They are truly beautiful people both inside and out! My husband and I had been chosen as delegates to a special convention held in Santiago, Chile. We were to be part of a group of 8 from our area, but sadly 4 of them had to cancel. The rest of us had a great time, but wished all 8 had been able to go. Of course, I wasn't able to paint for this time, but I did get some great photos which I will go through and sort for ideas for paintings. One of the photos turned out particularly well, and as it turns out, was the same as the logo for the convention. 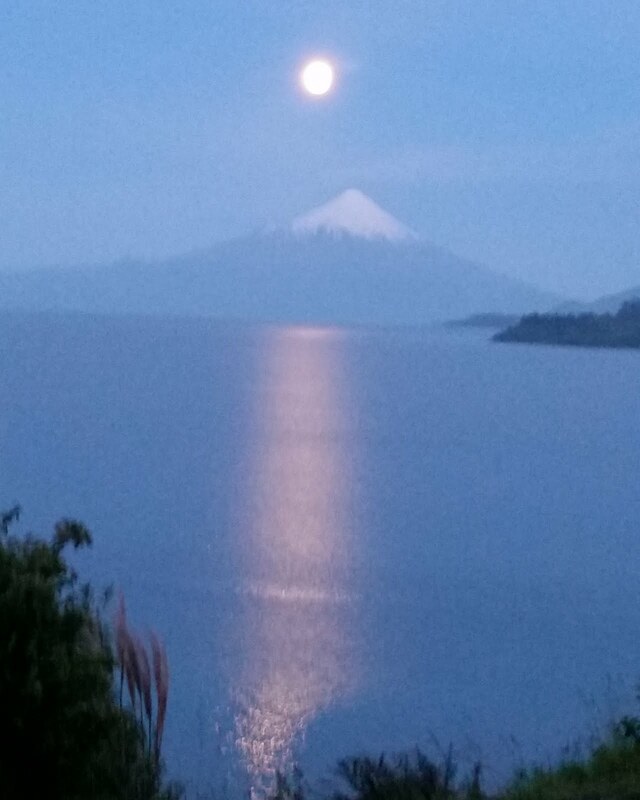 It is of the volcano known as Orsono in Puerto Varas, Chile, one of 11 volcanos in the area. It happens to be the prettiest and most photographed of the volcanos with a beautiful snow cap that looks like an ice cream cone and the moon rises right over the top of it creating a sight to behold. It was the view we had out of our window at the hotel. (I have a photo below) You will notice that it seems light for 10pm at night. This is in southern Chile which is just now coming into their summertime so it stays light until about 11pm and gets light at about 5am. Long days to say the least! They love it as this is a colder area with short summers. It is in northern Patagonia; close to the Antarctic! The volcano next to it is called Calbuco. It looked like Orsono until April 22, 2015 when it suddenly erupted without warning spewing ash and fire about 15-20,000 feet into the air! We were told to google it under "Calbuco eruption" and we would see pictures and videos of the "blow". Unbelievable! was all I could say...it was very scary and fascinating at the same time! One video shows what looks like a tornado of fire and lightning shooting from the top of the mountain. It lasted for several days and finally calmed down after 2-3 months of activity. Fortunately, no one was injured and most of the damage was in the uninhabited national forest area. Even so, it took months to dig out the roads from all the ash that was dumped for miles. it was approximately 3 feet deep in most areas. Amazing! I will attempt to paint this volcano as well as many other scenes as I get to it, but for now, please enjoy my photo below. Thanks for looking, and I hope to start painting again as soon as I can get some rest!